But it so happened that the other day I was talking to a young man at college and without warning I was catapulted into the middle of a faith conversation. One second, we’re talking about his interests in re-enacting medieval warfare. The next, he suddenly blurts out that he thinks that he thinks that religion is as the root of all war, that all religions are basically the same and that science has disproved the Bible. My first thought was, ‘Where did thatcome from?’ I mean, how exactly did he go from telling me why you shouldn’t engage the Marshal of Blackstone without suitable armor (or something to that effect) to tagging religion as the root of all evils? Fortunately, I’m quick on my feet and we’re in an ancient history class together, so I was able to point out that most of the wars we’d been discussing had more to do with power, money and land than religion. For integrity’s sake, I admitted that some wars were religiously motivated, of course, but humans will find an excuse to fight over anything. (So much for John Lennon’s ill-conceived “Imagine no religion…” argument.) He conceded that point, but immediately repeated his objection that all religions were basically the same. As I’m listening to him, praying silently to God for wisdom and discernment as how to best answer this misguided young man, a bell went off in my head. Weren’t these the sort of skeptic’s responses I’d been reading about in Bill Foster’s new book, Meet the Skeptic? In Meet the Skeptic, Foster suggests a new way to go about faith conversations. Noting that there are many reasons why people reject or discard a biblical worldview in favor of some other worldview, he nonetheless identifies four basic types of skepticism: Spiritual, Moral, Scientific and Biblical. Foster lays some groundwork for these faith conversations in the beginning of the book, reminding us that it’s not about winning or losing an argument, but about communicating truth. Only the Holy Spirit can convict a person and change their minds and hearts; we do not argue people into the kingdom of heaven. He also reminds us to speak their language. Some of the churchspeak we use [like “born again,” saved, “personal relationship,” “in my heart,” and theological terms like propitiation, justification, sanctification, etc.] can be confusing to outsiders. Worse, he points out that what we say and what the skeptic hears can be completely different or even carry a negative assumption to the one’s we’re trying to reach. I’m not prone to using King James English, but I really appreciated his reminder that other everyday terms we use can be just as obscure to an outsider. After mentioning this argument, this young skeptic conceded that there were differences between religions, but before I could get to the root idea of this objection [“Good works get you heaven”] and address it, he quickly launched into a series of objections regarding the age of the earth and the feasibility of Noah’s Ark. In my experience, there’s a fine line between the categories Foster identifies as Scientific and Biblical skepticism. He mentioned the Big Bang, evolution and the age of the earth, so I zeroes in on his Scientific skepticism. I should stop right here and mention something I do when I’m reviewing a book, because it will underscore my next few comments; when I first read a book I’m going to review, I dog-ear any page that contains something I either strongly agree or disagree with or wish to quote. I dog-ear the page in the direction of the selected passage, so occasionally a page is marked at both the top and bottom for each side of a page. Having said that, the section on Scientific skepticism is easily identifiable in my copy of Meet the Skeptic because it’s practically one big dog-ear! It’s that good! So first I gave him a few reasonable responses to his questions and waited for an opportunity to get at the root idea [“The natural world is all there is (Nature can do godlike things)”]. It came at an unexpected moment. We were discussing Noah’s Ark and he objected to the Ark being able to survive the floodwaters based on the discovery of an alleged exoplanet covered in water which scientists say has really big waves and, if made analogous to Earth would create waves 300 feet high during the Flood. At first, I contemplated asking him for a source for that claim, but then I decided it didn’t matter. I knew that feasibility studies have been done which amply demonstrate the Ark's ability to ride out monstrous waves, but I wasn't interested in playing the debate version of ping pong with this fellow. Instead I asked how much faith was required for his belief, as Foster recommends. He denied that science required any faith and asked me to explain, so I reminded him that no one’s ever visited an exoplanet and confirmed that it has water much less really big waves; that no one had ever seen everything come from nothing, life spring from non-life or one kind of animal change into a completely different kind; that these claims were not based on uniformity [as they were one-time events for which the present certainly could not be the key to the past! ], so that yes there was a great deal of faith in these scientists claims. I wish I could say that this resulted in a visible aha! moment for this skeptic. Instead, he shifted into an argument from Biblical skepticism, pointing out that if he could prove even one part of the Bible wrong, then science was true. To which I responded that all I could do was provide reasonable responses and, lacking omniscience, I reminded him that if I didn’t have an answer, it wasn’t quite the same as a question being unanswerable and therefore false; just as debunking the Bible would not necessarily prove science true by default – both could be dead wrong, though I obviously do not think so. Since he brought up alleged Bible contradictions, I intended to get to his root idea [“The Bible is man-made”] with Foster’s wonderful illustration of variances in copies of Granma’s recipe for Blackberry sauce [p. 121], but at that moment something very odd happened. His professor, who had apparently been listening to our hallway conversation from her desk, called to my skeptical friend and asked him if he was coming to class. In essence, she “rescued” him. Ah well, at least I hope I communicated truth to him – and I certainly got to test drive Foster’s method in a very practical way! So what did I think about it in action? Was it a flop because he didn’t beg me to tell him the Gospel? Did I do something wrong? Was it a success because I communicated truth and gave him reasonable answers to his questions? I think this encounter demonstrated the effectiveness of his strategy. It’s simple, practical and easy-to-remember. I think we’ve cluttered up the concept of apologetics and Foster returns us back to the basics with an uncomplicated way of organizing our thoughts during faith conversations and a more effective means of argument [getting at the root rather than pulling up endless weeds]. In fact, Foster provides a quick reference chart to the four categories, their root ideas and probing questions to ask on pages 134-135. There’s also a nicely illustrated workbook you can purchase for individual or group study [and a leader’s guide as well if you choose the latter option]. The workbook is much more than a read-through-the-book-and-fill-in-the-blanks sort of a study [I hate those]. It gives lots of opportunity to ask ourselves questions to better understand and utilize the concepts in the book, with the intent of strengthening our faith and making us better faith conversationalists. In all honesty, I’m going to suggest this book to my pastor for group study as an apologetics class. Let me put this plainly: This is a book that you really must have on your shelf. I’ve already read it more than once. It’s already so dog-eared that you’d think it a long time resident of my personal library! I recommend it not only for personal use but I also urge you to get a copy to your pastor or Sunday school administrator and encourage them to hold a study or apologetics/personal evangelism class. 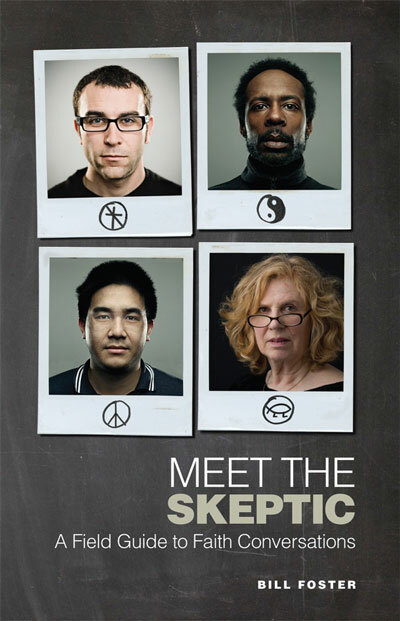 You can find out more about Meet the Skeptic at http://MeettheSkeptic.com or watch the book trailer at http://www.youtube.com/watch?v=gqJIzjbhqyI&feature=player_embedded.